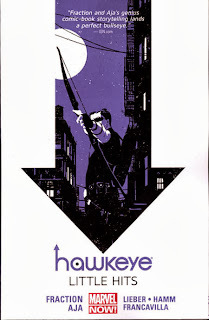 Even though it helped launched Marvel NOW!, Hawkeye still feels like no other book that Marvel puts out, either in storytelling or visual design. The Hawkeye Vol. 2: Little Hits collection features one issue told in anachronic order, one issue containing two stories, and four issues which slowly tell one long tale which will be finished in another trade. At times, the issues feel like they should all be read one right after the other ... but then, there are moments where Matt Fraction and his artists clearly want you to take a break between issues. It can be maddening to figure out the proper pace of reading. When it was first published, I was surprised that the previous trade, Hawkeye: My Life As A Weapon didn’t contain issue six. It makes sense in retrospect, as the issue is the first named appearance of Clint Barton’s neighbor “Grills," who is at the center of nearly every story in Little Hits. Grills is an oddball older man who doesn’t quite seem to be all there. We find out more about his background in the first story in issue seven with a visit to his cranky father out in Queens. Issue seven was written and drawn in record time to get it out so that it could be used to raise money for Hurricane Sandy relief. The devastation created by the hurricane is more powerful than any alien invasion just because of how realistic it feels. Grills’ presence in Hawkeye serves its purpose at the end of issue nine, when he’s killed by a newly-introduced villain, the Clown. The next issue provides the Clown’s origin, and it’s one of the rare cases where I wish Fraction had waited to tell this story. There’s nothing wrong with the origin; he’s a clown from a circus in an unnamed Eastern European country (the home of the Tracksuit Dracula gang) who lost his loved ones and sanity to a war-torn environment. But this story is being told to Kate Bishop during the events of issue #7 and #8, meaning that we spend four very decompressed issues in the exact same spot story-wise. Issue eleven moves forward just slightly, but it introduces another plot element that will be told from various angles over two issues after that. It’s frustrating even writing about Little Hits because there’s barely enough plot for three issues. What redeems the book is the storytelling flair of the creative team. It’s best to turn off “guided reading” on Comixology when reading Hawkeye because otherwise, the little details fly by without letting you appreciate the page design. Issue six uses an amazing amount of white space, but it’s in service to the winter-set story. David Aja uses this space, along with many small panels and specially-designed titles from Chris Eliopoulos, to set a sparse mood. There’s also an innovative sequence on page three in which Hawkeye, Wolverine, and Spider-Man take on AIM soldiers. By putting the headshots of the characters in one corner and positioning the characters carefully, it becomes a pastiche of a side-scrolling video game. Fraction also adds in shout-outs to Hawkeye’s adventure in Solo Avengers with Dr. Druid and the existence of the Avengers’ favorite show, “Dog Cops." Marvel split issue seven between two artists both because of the rush to get it out and because it tells two stories, but Steve Lieber and Jesse Hamm were up to the task. Lieber seems to emulate Aja’s style in his story about Clint, while Hamm has a cartoonier style more fitting to Kate’s story in which she’s stuck at an engagement party during the hurricane. Issue eight uses splash pages (drawn by Annie Wu) of lurid romance comics to separate its story sections and to subtly tell the backstory of “Cherry," Clint’s hook-up from the previous trade. She’s on the run after killing her abusive husband, one of the Tracksuit Draculas. Issue nine retells the previous issue while focusing on Clint’s relationships with Mockingbird, Black Widow, and Spider-Woman. David Aja gives all three of them '60s-style bouffant hairdos in a stylistic touch. Even though I’m annoyed that issue ten stalls the story in its tracks, I can’t fault the gorgeous art of Francsisco Francavilla; it got me to read his The Black Beetle recently. The absolute triumph of Little Hits is issue eleven, which is told from the point of view of Lucky the pizza dog, the abused dog Hawkeye rescued in issue one. This isn’t done with thought boxes, but rather with a unique set of symbol diagrams created by what the dog would smell. For instance, when patrolling the scene of Grills’ death on the roof, we see an icon of Grills’ head, which proceeds to a grill, then a beer bottle, and finally a skull and crossbones. See some examples from Comics Alliance. Even the colors are muted to match the world in the way a dog would see it. All of the actual word bubbles are filled with scratched-out text with only the few words Lucky would understand remaining intact, such as “dog," “help," “up” and “good boy." This is one of those books where I can’t figure out if I recommend it. It looks absolutely amazing, but Hawkeye Vol. 2: Little Hits is a frustrating read in a collected edition. If nothing else, you should grab issue eleven just to see how Fraction and Aja pull it off. In two weeks, I’ll take a look at another title featuring Kate Bishop which values style over substance. But next week is Halloween, so it’s time to get terrified by the Xenomorphs. Beware of cat scares!